In its 20+ years perched atop Del Mar Plaza, Pacifica Del Mar has solidified its reputation as a fresh fish haven. This past October, after Chris Idso's decade-long reign as executive chef came to a halt due to his promotion to managing partner, his position was passed along to the young and experienced Stephanie O’Mary-Berwald, whose resume includes tenures at the acclaimed kitchens of renowned chef Todd English and James Beard winning chef, Michael White, as well as a degree from Columbia University. 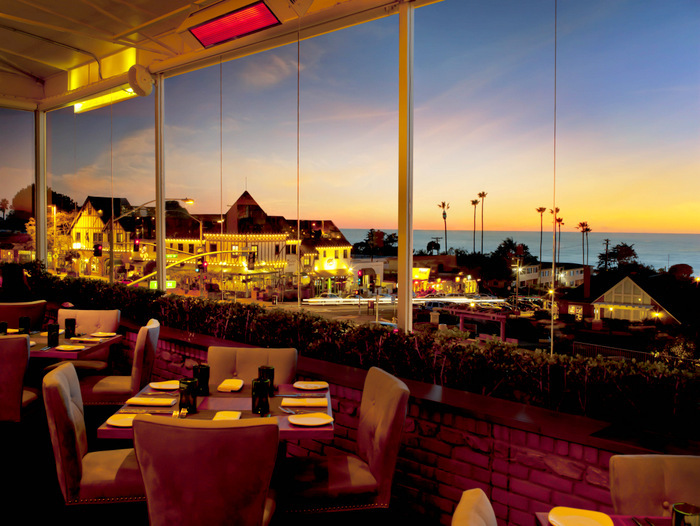 As food aficionados, we had to make our way to Del Mar to sample some of the new chef's offerings and a glimpse into the future of Pacifica Del Mar. Evidently a San Diego Restaurant Week favorite, Pacifica Del Mar's covered patio dining room was jam-packed when we went in to taste an array of Chef Stephanie O'Mary-Berwald's new dishes. 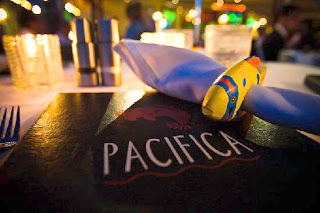 Although the interior decor is somewhat dated and the dining room boisterously loud, the view of the Pacific makes up for it and should be considered when making reservations (preferably during the daylight or sunset!). 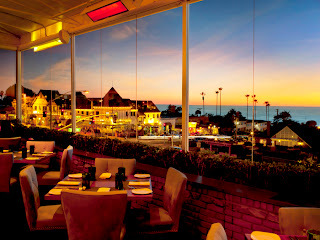 We settled into our window-side seats and were quickly presented with our tasting menus and the iPad wine list. Fortunately for us, it was Thursday, and bottles of wine were half priced, so we decided on a robust Earthquake Cab from Michael David Winery. We began with an amuse bouche of a crispy fried oyster wrapped in beef filet carpaccio atop an oyster shell stuffed with truffle mashed potatoes. This single bite was beautifully presented, delicious, and so texturally appealing. This should be a menu mainstay, and if this were to be any indication of our meal, we were excited for what was to come. Next we sampled the kabocha squash ravioli with sage croutons in a brown butter sauce. The sweet and creamy interior of the pasta melded nicely with the richness of the butter and the crunch of the sage croutons. Unfortunately, the stuffed pastas looked like they were cut by Helen Keller, and the dish was missing something - a punch to tie it all together, whether it be salt, spice or sweetness. Our next course was a coffee-braised pork belly served with a sous vide egg and a frisee garnish tossed in warm sherry vinaigrette. While I'm a big proponent of breakfast for dinner, the star of this dish was neither the 'bacon' nor the egg, but the roughage. The frisee was crisp, and infused with the rich and creamy vinaigrette, was one of the most appealing tastes of the night. While the crust of the pork belly was delicious, the fat did not adequately render, leaving some bites to be chewy and grisly. We were then served Chef Stephanie's 'surf and turf' dish - a seared scallop atop braised shredded short rib served with a marjoram pesto. Once again, the star of the plate was unexpected: the pesto was perfect, but the combination of short rib and scallop left me yearning for texture. The dish would have greatly benefitted from some starch...or crunch...or crunchy starch...something. For our last savory course, we enjoyed seared opah served with mixed color cauliflower, pine nuts, baby romanesco microgreens, golden raisins, kalamata olives and a flavorful tarragon remoulade. This was our favorite of the mains, with the fish cooked nicely and combined with the other components to make for a hearty dish. The green puree was delicious. We finished our meal with a white almond panacotta, served with raspberries, mint leaves and balsamic figs, and drizzled with a balsamic sauce. Although the balsamic's acidic scent made me nervous, everything came together harmoniously for an amazing finish to our dinner. Each of Chef Stephanie's dishes had wonderful elements, but there were also some subtle missteps along the way. Certainly, as she hones in her skills and becomes more comfortable in her new role, she will settle in and progress as an integral component of the future of Pacifica Del Mar.